Saplings is a half day camp specifically designed for 4 year olds. Campers will spend their day playing outside exploring nature. This camp will also include stories, crafts, nature activities and games. The camp is Monday - Thursday. The morning session is from 8:30am - 11:30am and the afternoon session is from 1:00pm - 4:00pm. This NEW camp is offered only once this summer during Week 10 of Summer Camp; August 19 - 23, 2019. Eco-Buds is a half day camp that is only offered at Maywood. The half day camp is designed specifically for 5 and 6 year olds as an introduction to camp. 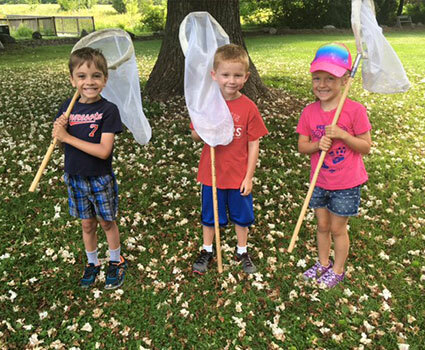 Campers will experiene traditional camp activities such as nature hikes/programs, stories, unstructured nature play, crafts, games, character building and more. The eco-bud program will prepare your child for a smooth transition into a full day camp at Maywood or Camp Y-Koda. We pay special attention to our youngest campers to make sure they are engaged and to make certain their first camp experience is a positive one filled with lasting memories. This camp is Monday - Thursday from 8:30am - 12:00pm, there is no camp on Friday. Eco-Buds is offered two times this summer and have a theme each week. The themes and weeks can be found below or in our 2019 Summer Camp Brochure, on the "2019 Camp at a Glance" layout on pages 8 - 9.